BRUSSELS, Jun 9 2015 (IPS) - We are witnessing a shift in the original rationale behind the unique relationship between the European Union and the African, Caribbean and Pacific countries of the ACP group, which goes beyond the logic of “unilateral aid transfer”, “donor-recipient approach” and “North-South dialogue”. With the agreement for that partnership coming to an end in 2020, both the European Union and the ACP group are currently stimulating intense debates on a critical review of the past and future perspective as well as challenging issues for the future “acquis” between the ACP countries and Europe under the umbrella of the Cotonou Agreement. Last month’s Joint Session of the ACP-EU Council of Ministers held in Brussels (May 28-29) May offered an occasion for discussing innovative options to outline new bases of common interests, needs and difficulties, and to forge forthcoming cooperation, particularly in terms of the post-2015 agenda, financing for development, migration, international trade, climate change and democratic governance. At ACP level, there is a growing awareness among members that “the Group will have to transform itself if it wants to realise its ambition of becoming a player of global importance, beyond its longstanding partnership with the EU,” said ACP Secretary General, Dr Patrick I. Gomes. 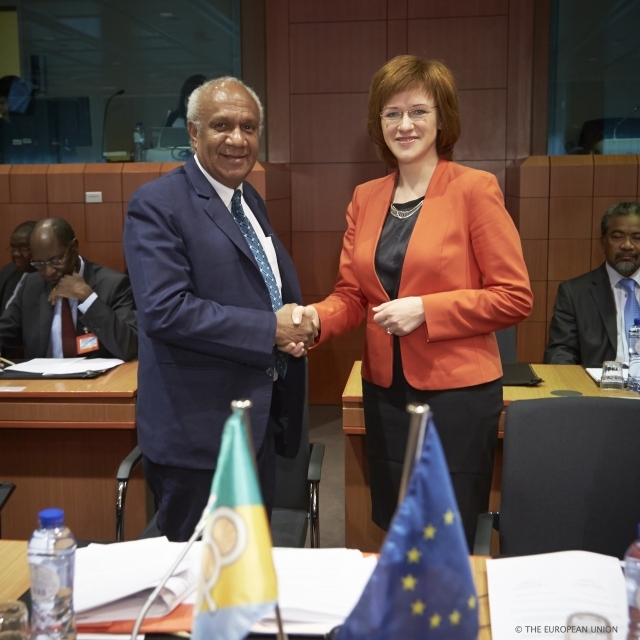 “There is the need to re-balance the ACP-EU partnership in favour of the ACP Group” was one of the key messages from the 101st ACP Council of Ministers held on May 27-28 to re-align ACP positions before the Joint Session with the European Union. Within the European Union, there is also recognition of the relevance of the EU-ACP relationship. “Our exchanges of view on a number of key issues such as the post-2015 development agenda and migration once again underlined the importance of our partnership,” said Zanda Kalniņa-Lukaševica, Latvian Parliamentary State Secretary for E.U. Affairs, in a statement. On paper, the Cotonou Agreement remains the most sophisticated framework for ACP-EU cooperation, covering political, trade, economic and development cooperation issues. According to the last figures for the E.U. budget for 2014-2020, a package of 30.5 billion euros is specifically provided to ACP regions and countries. In fact, the ACP still remains the biggest group of states with which the European Union has a partnership. The European Development Fund (EDF), an implementing instrument of the Cotonou Agreement, will finance E.U. development cooperation projects until 2020 to assist partner countries in poverty eradication. These funds will target the people most in need and finance different sectors such as health and education, infrastructure, environment, energy, food and nutrition. Looking towards the future, the ACP is determined to move from being on the receiving end of development assistance to asserting its aim to speak with “one voice in global governance institutions”, in the words of ACP Secretary-General Gomes. The need to consider and treat ACP countries as “responsible partners” at the global level despite the reluctance of the international community, emerged strongly during the E.U.-Africa Summit in April 2014, with ACP members hoping for a lift-up effect on the ACP’s political leverage. According to observers, ACP countries matter for the European Union partly to help overcome the effects of the economic crisis. Some ACP countries in the North African region, for example, have witnessed upturns in economic growth since 2004. At the same time, the abundance of natural resources in ACP countries provides an alternative to the volatile Middle East, Russia and some other countries as a source of energy and raw materials. He was referring to the Third International Conference on Financing for Development which will take place in Addis Ababa, Ethiopia from Jul. 13 to 16 this year. Observers also point out that the ACP countries can also be important interlocutors during the U.N. Climate Change Conference this coming December in Paris. While the Western industrialised and emerging countries are the main greenhouse gas emitters, many ACP countries – particularly Small Island Developing States (SIDS) – are directly threatened by the consequences of climate change through, for example, natural disasters, hurricanes and tornados, flooding and drought. Their voice on this, along with their experience and good practices developed in countering or mitigating the drastic effects of climate change, can make a useful contribution to the deliberations in Paris. Meanwhile, the ACP-EU Joint Council has endorsed recommendations concerning the migration crisis, including enacting comprehensive legislation on both trafficking in human beings and smuggling of migrants, stressing the differences between both phenomena, while also implementing relevant national laws.